Have you seen the new movie “Fed Up”? It spotlights America’s obsession with sugar and lack of exercise, due to the lies the government has led us to believe. 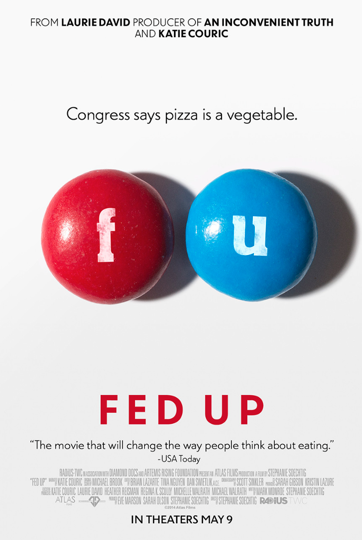 The movie poster highlights the words, “Congress says Pizza is a Vegetable”. Sadly, some people believe that is true. America needs to learn that tomato paste is NOT a vegetable and French Fries do NOT count as a daily serving of fruits & veggies. If you need motivation to start eating healthier and working out, then this movie is a good start. View the Fed Up movie trailer here: http://fedupmovie.com/#/page/home. What you are your thoughts on this movie? 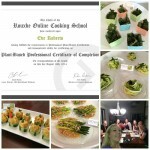 What is edible, been around for centuries, and is packed full of nutrients? BroccoLeaf! The reinvented organic super food that is coming to grocery stores. 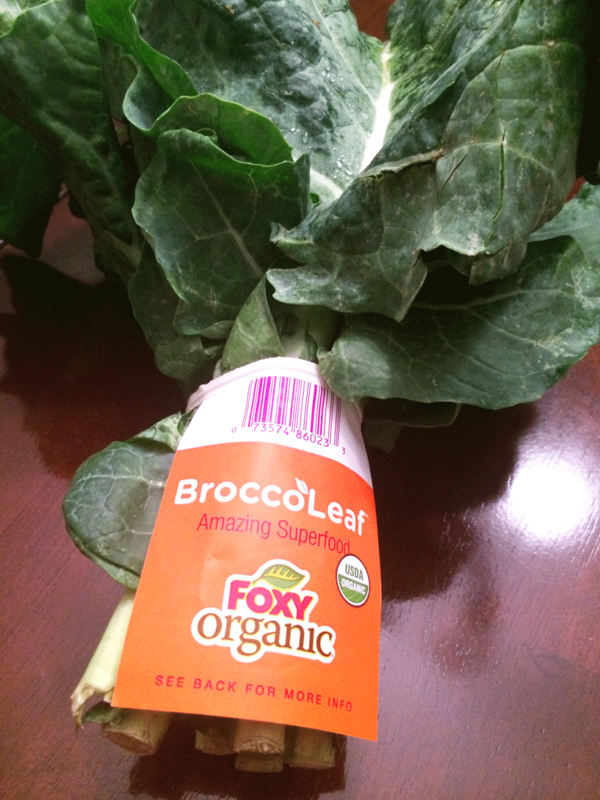 We typically only eat the fruit of the broccoli plant, but Foxy Farms has discovered that the broccoli leaves are just as edible. The leaves are an excellent source of vitamin A, vitamin K, calcium, folate, and provides a 100% daily dose of vitamin C. It is sweet and crisp without the bitter taste. 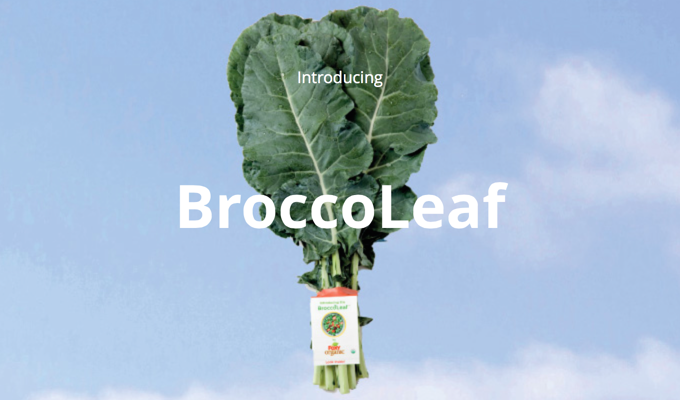 BroccoLeaf might just be the new kale on the market. 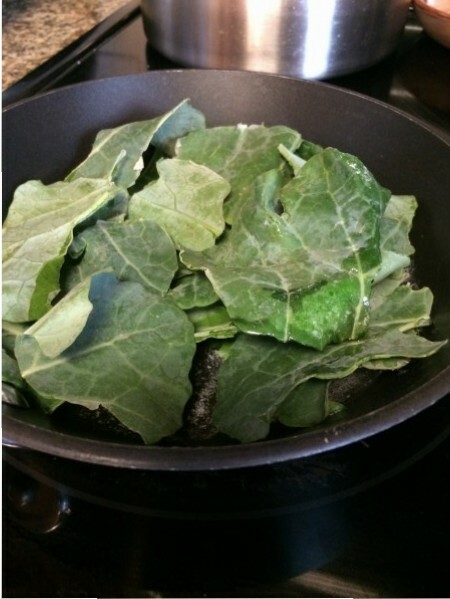 If you have broccoli growing in your backyard, give the leaves a try! For more information visit the Foxy Farms website. Incentives can be a powerful tool to achieve a desired end result. 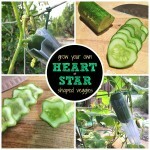 Would you eat more fruits & vegetables if you knew you would earn a prize? The government is currently funding a $31 million grant program to find out that exact question… can incentives increase the fruits and vegetables consumption of low-income consumers? In 2012 the USDA, performed a similar study in which they allowed SNAP (Supplemental Nutrition Assistance Program) households to receive 30 cents on every SNAP dollar spent on specific fruits and vegetables. The cost savings incentive increased consumption of these specific fruits and vegetables of about one quarter of a cup per day. 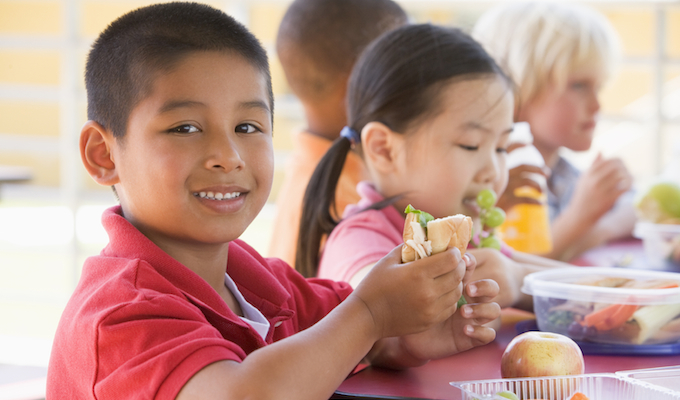 In the United Kingdom, researchers from the Universities of Edinburgh, Essex, and Bath gave elementary students a star for every time they choose a portion of fruits or vegetables at lunch time or if they brought it from home. After a student earned 4 stars they would earn a prize such as a highlighter pen. Once the incentive program was removed from the school, the majority of the children continued to eat more fruits and vegetables. 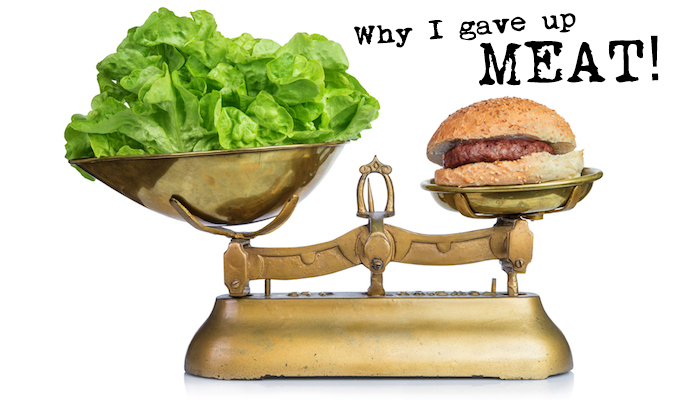 If you are struggling to eat your veggies, maybe an incentive is what you need to get motivated! The SavingStar.com is offering a coupon for 20% off a single purchase of lettuce! The 20% offer is valid on purchases of loose, unwrapped lettuce up to $10. The coupon is valid from October 7 – 13, 2014 and must be downloaded from savingstar.com. The offer is not eligible on produce weighed and tagged using a produce scale prior to checkout. 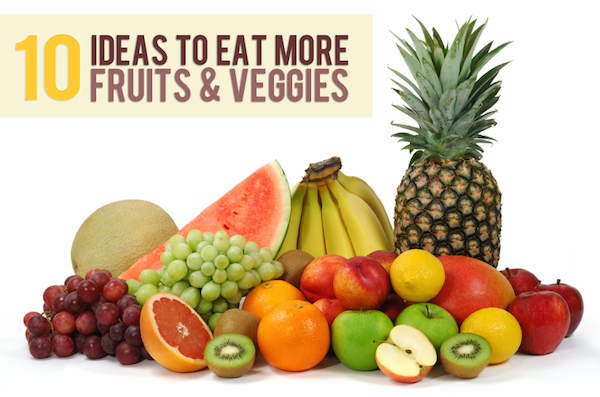 SLICE – Sliced fruits are visually more appealing which will make you subconsciously grab for them more! PRE-PACKAGE – Cut up veggies and put them into individual sized baggies for a quick on the go snack. Use items that stay well in the fridge for a few days, such as carrots, celery, broccoli, oranges, grapes and pomegranate arils. DRINK – Make a smoothie, buy a juicer to juice them, or drink V8. SUBSTITUTION – Serve protein such as chicken or fish over veggies instead of rice or pasta. Try Cauliflower Rice! MIX IT IN – Add veggies to store bought spaghetti sauce, chili, or lasagna. ADD ON TOP – Add fruits to the top of cereal, oatmeal, waffles, ice cream, etc. DIP IT – Ranch dip for veggies or carmel for fruit can be a great treat to help you eat more fruits & vegetables. CHEESE – Add cheese to the top of any vegetable to make it a little easier to eat. 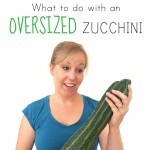 SNEAK IT IN – Shred carrots or zucchini and then add it to meatloaf, hamburgers, or meatballs. Also, puree cauliflower, squash, or bell peppers and add them to sauces, mashed potatoes, or pot pies. MAKE IT FUN – Eating fruits and vegetables is so much easier when it is fun and exciting. 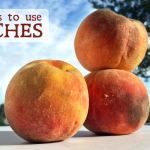 Grill peaches, create veggie skewers, or make creations such as ants on a log (peanut butter stuffed celery with raisins on top). How do you like to enjoy your fruits & vegetables? The stickers on fruits and vegetables are called a PLU, which stands for Price Look Up. They have been in use since the 1900’s to make check-out and inventory control easier for grocery stores. 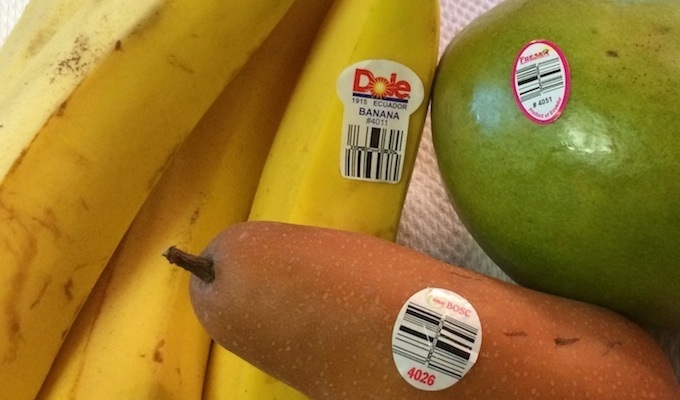 The fruit stickers are attached with FDA approved food grade glue. All produce uses the same PLU codes. There are a total of 1421 PLU codes. All fruit & vegetable labels come with a 4-5 digit PLU code. Conventionally Grown Produce use a four digit number that begins with a 3 or 4. A banana for example would be #4011. You might also see these numbers with a zero in front, however zero is usually omitted. Conventionally grown produce means that the produce was sprayed with pesticides, chemical fertilizers, or weed spray. Genetically Modified Produce use a five digit number. It is the same number as above, but the # 8 is attached to the front. A banana for example would be #84011. Genetically modified produce (GMO) means the plant or seed has been genetically manipulated or genetically engineered to make the fruit larger, prettier, juicier, or to make it grow faster. This is the worst type of produce to consume. “8 is FAKE”. Organic Produce use a five digit number. It is the same number as the congenitally grown produce, but the # 9 is attached to the front. A banana for example would be #94011. Organic produce is the safest type of produce to consume as it was not sprayed with pesticides nor was it genetically modified. “9 is FINE”. PLU codes are not regulated by a government agency and are therefore voluntary. However, most grocery stores require them from the farmers. This is why you see them on some, but not all produce items. 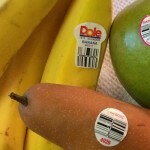 The barcode you see on the produce labels are called a DataBar, which is a smaller version of a UPC code. It is a code specific to the manufacture, and it not in most grocery store databases. That is why cashiers still type in the PLU #. Remember… 8 is FAKE, 9 is FINE! For more information on PLU codes visit www.plucodes.com/docs/Users_Guide.pdf.